The presentation of one of the world leaders in the production of milling machines aroused great interest among representatives of the Novosibirsk business. The presentation brought together technical Directors, chief engineers and technologists of the largest metalworking enterprises of Novosibirsk, including: “Research Institute of measuring instruments — Novosibirsk plant named after Komintern”, “Machine-building plant Trud”, «Radio and Microelectronics», «Sibelektroprivod», «Novosibirsk aircraft repair plant», FSUE Production Association «Sever», RPA «ELSIB», «Novosibirsk instrument-making plant», «Ekran-optical systems», SMC «Steelline», «Siblitmash», «Corporation-Novosibirsk plant Electrosignal», «Novosibirsk electric vacuum plant-Soyuz», «Novosibirsk power machine-building plant «TAYRA». Apart from industrial enterprises, representatives of educational institutions that train engineers and specialists in the field of machining showed interest to the latest metalworking technologies. In particular, the staff of the faculty of Mechanics and Technology of the Novosibirsk State Technical University, Novosibirsk Engineering College, Novosibirsk Aircraft Engineering Lyceum, Novosibirsk Aviation Technical College named after B. S. Galushchak, Berd Electromechanical College and Novosibirsk Industrial College. The Vice President of the Novosibirsk City Chamber of Commerce and Industry Tatyana Bernadskaya addressed the participants of the seminar with a welcoming speech. She noted the importance of such events, which enable companies to learn about the latest world developments, technologies and tools in the field of industrial production, as it is a driver of development of both industry and the economy as a whole. The participants of the seminar have the opportunity to get answers to their questions in an informal atmosphere, to discuss the possibilities of cooperation. Alexey Trusov, commercial Director of the Hermle AG representative office in Moscow, spoke about the modern 5-coordinate machining centers of the Hermle AG company, which are high-tech equipment with a high level of automation, which ensures the maximum possible efficiency. According to him, processing with 5 axes provides significant advantages in time and accuracy, especially in the manufacture of complex parts with demanding geometry. With their help it is possible to make the most difficult milling, and also at the same time turning and milling processing. 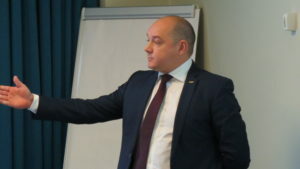 In addition to the experts of the company Hermle AG, the representative of the company Guhring Anton Ponomarev spoke to the participants of the seminar, who told about the metal-cutting tools which are used for a direct high-speed milling. The representative of the company HEIDENHAIN spoke about innovation in the numerical control. The company HEIDENHAIN develops and manufactures sensors for the measurement of linear and angular displacement, rotary encoders, digital readouts and the system of numerical control for positioning tasks requiring high precision. The company’s products are used primarily in high-precision machines and devices for the production and further processing of electronic components. Dmitry Makov, a representative of Cimcool, a world expert in industrial fluids, spoke about the latest trends in the industry of cutting fluids (coolant), which are used in machines and directly affect the process and quality of processing. During the presentation, representatives of Novosibirsk enterprises received answers from experts to all their questions, exchanged experience and contacts.